Brush the outside of the tortillas with a small amount of oil or margarine. Evenly brown both sides in a heated frying pan. Repeat with the rest of the tortillas. Set aside. Spread about 1/3 cup of the bean mixture on each tortilla pizza. 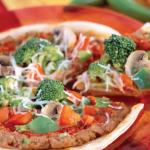 Sprinkle with 1 tablespoon taco sauce, then top with ½ cup of the chopped vegetables, 1 teaspoon chili peppers, and 1 tablespoon cheese for each pizza.